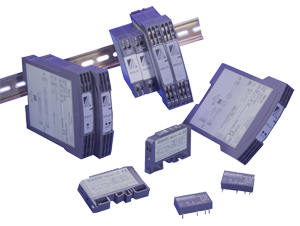 Dataforth's DSCL series of isolators, along with the DSCP and SCTP product lines, provides a complete family of loop and universal AC/DC powered isolator and transmitter models in component, DIN rail, panel, and head-mount packages. Depending on the model, they accept a wide range of voltage, current, thermocouple, and RTD input signals, then filter, isolate, amplify, linearize, and convert them to high-level analog outputs for use in data acquisition, test and measurement, and control system applications. They protect valuable measurement and control signals as well as connected equipment from noise, transient power surges, internal ground loops, and other hazards present in industrial environments. Loop Powered Isolator - "Component Module"
Does Dataforth have a 4-channel 4-20mA isolator? No. However, Dataforth does have two and three-channel 4-20mA isolators as shown in the following table. Does Dataforth have an isolator with one input featuring two or more outputs? No, but this function can be implemented with a two or three channel loop isolator, such as DSCL22-11, DSCL22-21, DSCL24-11, or DSLC24-12. Connect all inputs in series with each other. Sum together all input burden voltages so as not to exceed the maximum loop voltage available. Why do I see a -10V shift when I change to a DSCL23 from a DSCA42-01C or similar? The DSCA42-01C internal electronics is powered by an overall power supply and then the module output circuitry provides the output current whose return side (or negative side) is connected internally to the power supply common. This causes the output signal to be positive with respect to the common. Whereas, the DSCL23 is loop-powered through its output terminals. That puts the 4-20mA receiver (the load) in series with the power supply. So when you measure the voltage from the power supply common (- terminal) to the other side of the load you will see a negative signal. The module could be made usable if the power supply has a fully floating output and you can make terminal 1 (the return current terminal) the common and measure the positive signal across the load from the power supply (-) to terminal 1 (the return current terminal), the common. A better match for your application is the DSCA42-01C. Its internal electronics is powered by an overall power supply and then the module output circuitry provides the output current whose return side (or negative side) can be connected to the power supply common. This causes the output signal to be positive with respect to the common.